This is what Northern Michigan summers used to be. A precious week or two at the family cottage on the lake. Long days spent fishing, boating, swimming, and generally soaking in the fresh air and freedom of the great outdoors. Cool nights spent beside a blazing bonfire, roasting marshmallows, and gazing up at star-filled skies. Those days are here again…at Brookside Cottages. “So much to do” may actually be an understatement. Brookside’s outdoor amenities are considerable. The property has 350’ of frontage on Duck Lake, a scenic, deep-water lake known for exceptional fishing, boating, and popular watersports. Brookside also has 600’ of frontage on Mason Creek, a registered trout stream. The owners offer complimentary kayaks, paddleboards, and rowboats to guests, making it easy to explore this water wonderland. As an added bonus, Brookside even has a huge water trampoline so the kids can practice their “cowabungas”. For those who prefer a more poolside experience, Brookside offers a heated, in-ground pool, hot tub, and spacious deck. What about rainy days, you ask? Not to worry. Brookside has plenty to fill those hours too. It has a large game room with a pool table, plus air hockey, ping-pong, foosball, and more. The big screen TV is perfect for catching the big game. From the moment you arrive, you feel welcome at Brookside. The property is laid out in a park-like setting that provides guests a chance to share time with other families or simply enjoy their own personal space. Built in the 1930s, the 13 original cottages have retained much of their original character, despite receiving considerable contemporary updates. 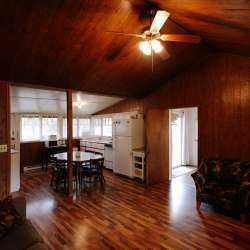 Brookside also offers a 2,880-square foot main house that sleeps 14 in beds, as well as a comfy apartment that sleep four in beds. 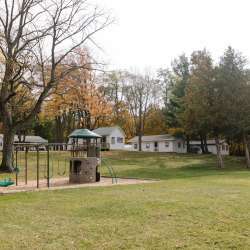 The property also offers two RV sites with full hook-ups.